Discussion in 'CZ Support Zone' started by viman96, Jul 27, 2017. Is there a new ad wanting flash?! The last couple of days has been annoying to keep getting this popup on my phone. Reality and Trouty like this. I've been getting this as well with desktop Chrome. I spent a little time trying to track it down, but no luck yet. I know it is not ad related though. I will keep looking into it to figure out what's going on. I detest Flash so I definitely don't want anything on the site using it. Trouty and viman96 like this. Okay, found the problem. 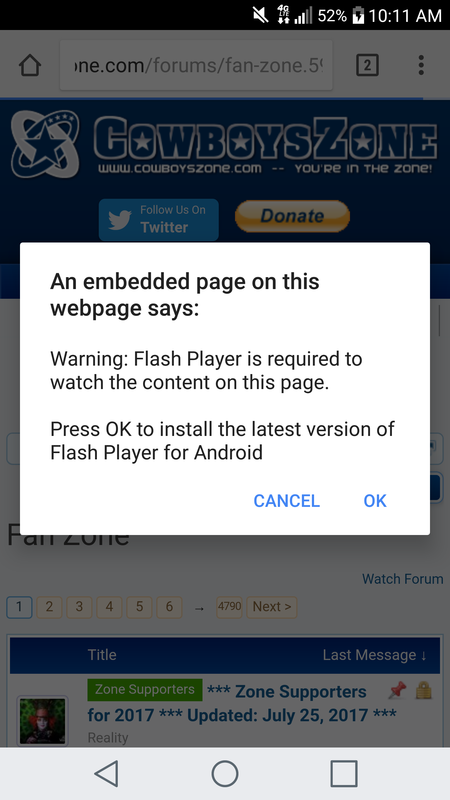 Apparently Chrome and possibly other browsers have made a change to start warning about flash objects and the software behind CZ was loading a flash-upload option for those who have flash installed. Meaning, it was already there and likely being blocked, but now the browsers are informing users that it is being blocked most likely because browsers are finally starting to phase out flash and even Adobe itself is doing the same. In any case, I disabled that option so it should no longer generate that error popup. Trouty, viman96 and Idgit like this. I am still getting the pop-up. When I get home I'll see if there's anything to do on my side to prevent it.